Chris Norton knew it was going to be a weekend to remember. He was planning to propose to his girlfriend, Emily Summers, on Saturday. 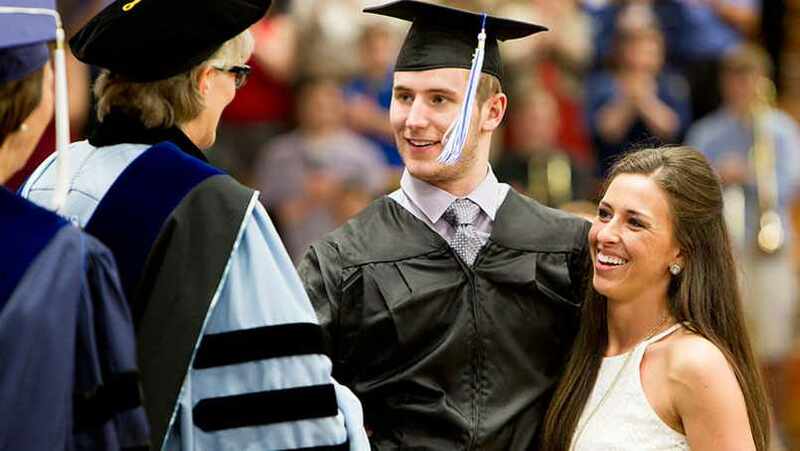 The next day, he'd walk across the stage to accept his diploma during Luther College's graduation ceremony. Those would be difficult steps for Chris, steps he had worked for nearly five years to be able to take. The walk would be epic, though, and to Chris' surprise, would result in cheers that would continue, virtually, throughout the week. By Monday, Chris had gotten the girl, the degree — and more media attention than he ever imagined. The Des Moines Register, USA Today and Today.com were all over the story. NBC News and Fox & Friends interviewed Chris and Emily. The Huffington Post pronounced, "Paralyzed Ex-Football Player Chris Norton Walked Again, Graduated and Got Engaged," while asking the rest of us, "How Was Your Weekend?" "It's been wild," Chris told us during a quick telephone interview before he and Emily flew to New York to appear on a little show called Good Morning America. "I never expected this to happen," he says. But the story — combining tragedy, perseverance and romance — proved hard to resist. "I keep hearing that people love the story," says Chris. It's easy to see why. We've followed Chris' story from the beginning, when he was airlifted to Mayo Clinic after the 2010 football injury that left him with an uncertain future. Doctors initially gave Chris less than 3 percent chance of regaining feeling or movement below the neck. But within two weeks of the accident, he was driving a motorized wheelchair — and asking his therapists, "Doesn't this thing go any faster?" That drive (ahem) helped Chris blast through early predictions about his recovery. His team at Mayo Clinic was right there with him. "I wouldn't be where I am today without Mayo," he tells us, adding that he feels "blessed" that Mayo Clinic — and its Spinal Cord Injury Rehabilitation Program — was so close to Luther's campus in Decorah, Iowa. "I'll never forget what Mayo did for me," says Chris, who launched the SCI CAN Foundation to raise money to help others with spinal cord injury and neurological disorders get access to the kind of equipment and therapy he benefited from. He's also helping to establish the Neurological Recovery House in Rochester, to provide "affordable lodging for family members of patients undergoing extended neurological treatment." Check out Chris' video from graduation day and share your comments below. And don't forget to share this story with others using the social media tools atop this page. Chris and his fiancé were also on Good Morning America this morning, interviewed by Robin Roberts. He is such an inspiration. He actually stated that if he would have the opportunity to not be injured he would not change anything because of what he has learned and that he feels called to help others based on his experiences. What an amazing young man!